Hedley singer Jacob Hoggard has said that “touring is our favourite time of the year” and to prove it, the band has embarked on a massive cross-Canada tour to promote their sixth album Hello. After an opening set by Carly Rae Jepsen, the B.C. rockers are set to strut their stuff on the Rogers Arena stage tonight. 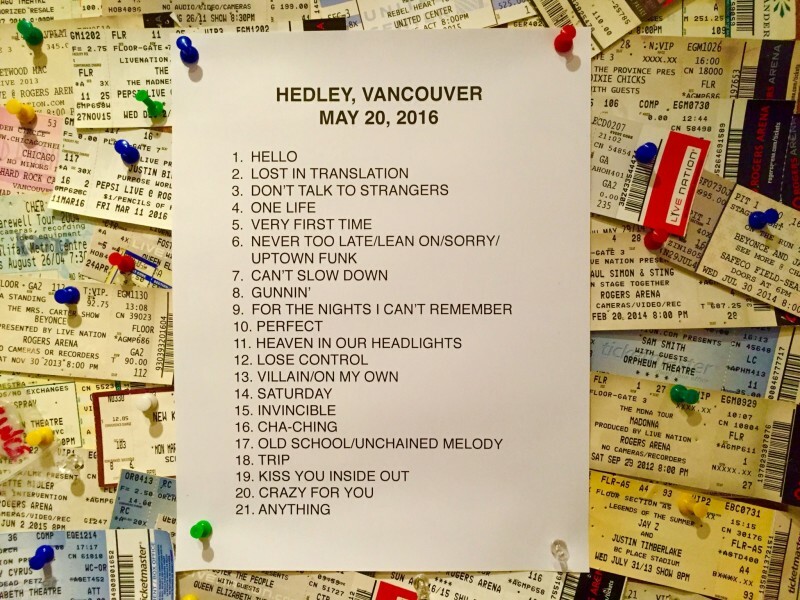 Judging by their setlist, Vancouver’s Hedley fans are in for a night they’ll surely remember (hit song “For The Nights I Can’t Remember” obviously made the cut). The show is mostly comprised of songs from Hello which debuted atop Billboard’s Canadian Albums chart last year. In addition to the album’s title track, fans can expect to hear current singles “Can’t Slow Down” and “Lost In Translation”. A handful of classic Hedley hits are also on the menu for tonight. The boys will perform “Invincible” from their Juno Award-winning album Storms as well as an intimate version of “Gunnin” that will have drummer Chris Crippin temporarily trading in his sticks for an acoustic guitar. “Cha-Ching”, which the band performed during the closing ceremony of the Vancouver Winter Olympics, will make an appearance tonight and so will a medley of covers that includes Mark Ronson’s “Uptown Funk” and Justin Bieber’s “Sorry”. Not only is Hedley one of Canada’s most prolific rock acts, but they’re also one of the most generous: they’ve released tickets to several of their upcoming shows for just $20, with all proceeds going to the Red Cross Fort McMurray Relief Fund. A few tickets for the Hello World Tour are still available for purchase here.